Our Initiated Meditation curriculum (gurukulam) is known by the Sanskrit name Hansasamvid. This curriculum is placed seventh due to the curriculum’s focus on personal daily practice of a structured meditation directly learnt from our unbroken lineages of adepts. 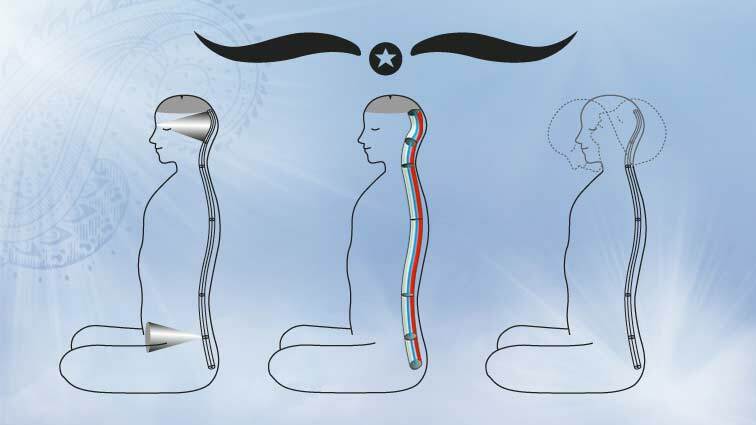 While other curricula of this system offer guided meditation made available through the online learning platform and through our in person fellowships, the Hansasamvid teachings and meditation techniques are conferred only through initiation from the lineage. The initiation blessings overcome certain shortcomings and nurture deeper yearning. Meditation techniques are taught in a week-long retreat rather than hurriedly over a weekend workshop. The daily schedule of the retreat is carefully structured for maximum reception through silent participation. The initiation-meditation retreats are typically held twice a year covering four meditation paths of the Himalayan Kriyā system, namely KriyāYoga, KriyāVinyāsa, KriyāLaya, and KriyāMantra. These Hansasamvid retreats are separate from the Hansayogin workshops and retreats. The Hansasamvid teachings develop a deeper understanding on how persistent meditative practices are best supported by regular prānāyāma breathwork for introversion of the sense organs, thereby minimizing distractions. The beginning meditator is able to see clearly how the doctrine of self-interest as the valid end of all actions, verily defined as egoism, is in reality geared towards expanding the experience of the world. Naturally, mindfulness even in momentary periods overcomes any exaggerated sense of self-importance prevailing during actions, thereby purifying traces of egotism. The mindful server is able to experience how duty with loving feelings without the expectation of personal gain helps transcend the pangs of egoism and egotism. Furthermore, the meditator sees how motivation for expanding the experience of the world arises from afflictive tendencies. While afflictions and their associated subtle desires are the cause of worldly experiences, they are also the foremost obstacle to one-pointed concentration both in meditation and all-round human excellence. The function of egoism is always connected with ignorance. If egoism is conquered, ignorance loses its grip and discriminative understanding matures. The meditator learns that the hankering for external sources of impressions and visual triggers can be controlled or paused at will. A deeper understanding of the roots of passion enlightens the aspirant about how dispassion (vairāgya) in its developing stages does not necessarily compromise spiritual enthusiasm (utsāha). A better way dawns that is dispassionate towards worldly allurement which further helps transcend the raw passion for fame and recognition. Through a meditative lifestyle and introspective reflection, one can articulate the right livelihood through better use of natural resources without buckling under the pressure of competition. Here faith in one’s own heart’s intent ultimately assists in finding the right balance where work can become worship. The power of the mended and peaceful mind manifests a higher reality. The Hansasamvid curriculum practice clearly guides towards wise actions that do not stoke the ego! What is needed by the meditator in this curriculum is the firm anchor in a daily practice. Meditation is considered not just as a service to the body (because in deeper meditation, body awareness is transcended); it is definitely the way to be immersed in mindfulness and thereby harness the mental prowess. Dispassion is experienced as relieving oneself from worldly distractions while enhancing the consistency of meditation practice. Dispassion grips the meditator in stages and yet does not take away from the wisely proactive actions or meaningful service. Passion is said to be transcended into compassion for the world through the art of dispassion. Other higher initiations on Vedāntic aham-graha contemplation based on Upanishadic verses or the rumination on truth-bearing aphorisms as per Sāṅkhya philosophy are offered in a separate curriculum not listed here, requiring deeper personalized study. The intent with this advanced study leading to contemplation or rumination is to fully anchor in Self-enquiry. Herein the aspirant’s inquiry relies upon superseding the regime of wilful actions or techniques that simply mend the mind. Instead, deep meditation practices leading to total arrest of thoughts are invoked that help create an understanding of the roots of willpower through mind control. This tradition is anchored in the deepest understanding of the underlying principles of creation and evolution; and is aptly equipped to resolve burning questions such as: How can free will be a product of human evolution? Is there a clear delineation between mind and ego? Do we attain repose in our intellect and access the inner voice? Is reclaiming tranquility the highest goal in meditation? Inquiry matures in an ardent meditator through these advanced teachings. For example, this simple group of seven statements hints at the urge of some supreme being with an immense mental prowess as being behind creation: The chain of phenomena is eternal. A phenomenon must have a knower. An unknowable phenomenon is verily impossible. An existent thing never becomes nonexistent. A nonexistent thing cannot come into existence. Nothing can come out of nothing. A real effect arises only from a real cause. Hariharananda Aranya, Swami. Yoga Philosophy of Patanjali with Bhasvati (Hardcover). Calcutta: University of Calcutta, 2000. Lahiri, Shyamacharan and Bhupendranath Sanyal. Spiritual Gita (Vols. I-III). India: Sundeep Agarwala, 2001. B.V. Narasimha, Swami. Self Realization – Life and Teachings of Sri Ramana Maharishi. Tiruvannamalai: Sri Ramanasramam, 2007. M, Sri. Apprenticed to a Himalayan Master (A Yogi’s Autobiography). Madikeri: Magenta Press, 2011. Sri Aurobindo. Essays on the Gita. Twin Lakes: Lotus Press, 1995. Venkatesananda, Swami. Vashishta’s Yoga. Albany: SUNY Press, 1993. His Holiness offers initiation into four paths of meditation: KriyāYoga, KriyāLaya, KriyāMantra and KriyāVinyāsa.